Nottinghamshire’s Matt Carter has agreed a new two-year deal to keep him at Trent Bridge until 2020. The tall off-spinner has enjoyed a breakthrough season after making both his List A and T20 debuts for the club during the 2018 season. 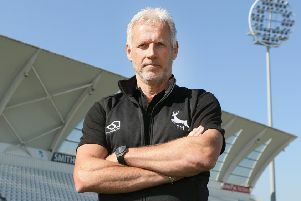 Carter was the leading wicket taker in the 50-over competition with 13 dismissals in just five games at an average of 15.23, including figures of 4-40 on his debut against Warwickshire at Trent Bridge. The 22-year-old has also taken 16 wickets during four County Championship starts for Notts this season, including a five-wicket haul against Somerset down at Taunton. Speaking on signing his new contract, Carter was delighted to have re-signed with the club. “I’m over the moon to have a signed a new deal at Notts,” he said. “I feel like I’ve had a good season and to be rewarded with a new contract shows that my hard work has paid off. Director of cricket Mick Newell was full of praise for the young spinner after he put pen to paper on his new deal. “We’re really pleased to have been able to keep Matt at the club for the next couple of years,” said Newell.